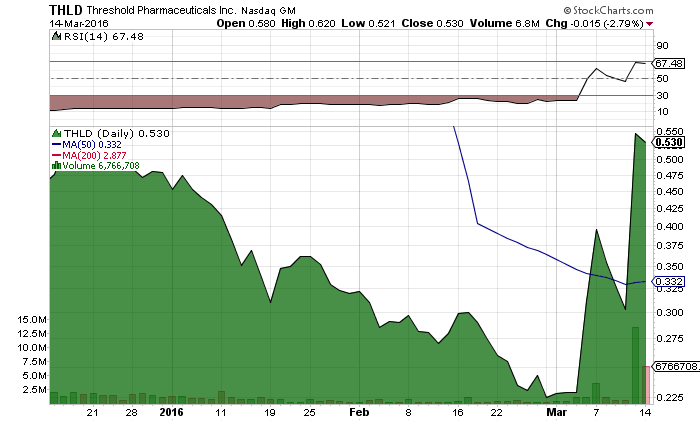 Threshold Pharmaceuticals, Inc. (NASDAQ:THLD) posted huge results of $0.86 profit per share leading to a powerful rally. THLD has been staging a massive rally after its share price collapsed from $4.00 towards the end of 2015. The share price has surged almost 200% from its 52-week low and continues to establish a healthy, but powerful advance. THLD posted net income of almost $70 million for the fourth quarter. For the year, THLD posted net income of $43.8 million or $0.54 per share earnings. Revenue posted for the full year was almost $77 million. Analysts expected revenues of $4.5 million which the company blew past. Excluding non-recurring gains, THLD posted $0.62 earnings per share which is still impressive given that the stock is trading at $0.53 which is less than its current earnings. In recent developments, THLD announced that it had terminated its global license and development agreement with Merck. As part of the termination agreement, THLD will likely be paying tiered royalties on sales and milestone payments depending the future successful development and commercialization of the drug. In addition MAESTRO study of pancreatic cancer demonstrate meaningful improvement in median overall survival and other secondary endpoints for Japanese patients. THLD is headquartered in San Francisco, CA. It is a research driven biotech company with a core focus in the discovery and development of tumor-targeted therapies to improve lives of patients that have cancer. Threshold’s investigational small molecule, evofosfamide, is being evaluated in two Phase III clinical trials, one registrational Phase II clinical trial and various earlier-stage clinical trials for the treatment of various diseases, such as soft tissue sarcoma, pancreatic cancer, non-squamous non-small cell lung cancer (n-s NSCLC), advanced melanoma, multiple myeloma and advanced solid tumors. THLD is currently trading at a $68 million market valuation. THLD is staging a turnaround with surging revenues, huge net income improvement, and significant growth in EPS should lead the company forward. In addition, the successful study of MAESTRO should provide investors with reasons to be excited about this small cap company. Stay tuned for more updates. We will be updating on THLD when more details emerge so make sure you are subscribed to Microcapspot so you know what’s going on with THLD. Disclosure: we hold no position in THLD either long or short and we have not been compensated for this article.